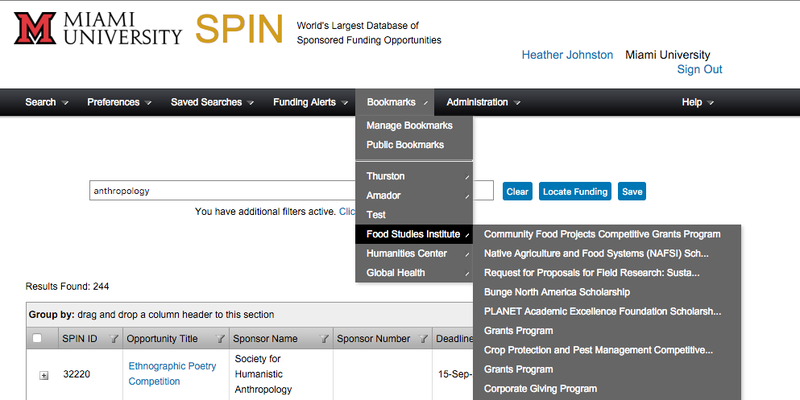 Since August, Miami University has subscribed to InfoEd’s SPIN Global Suite, a database of sponsored funding opportunities. 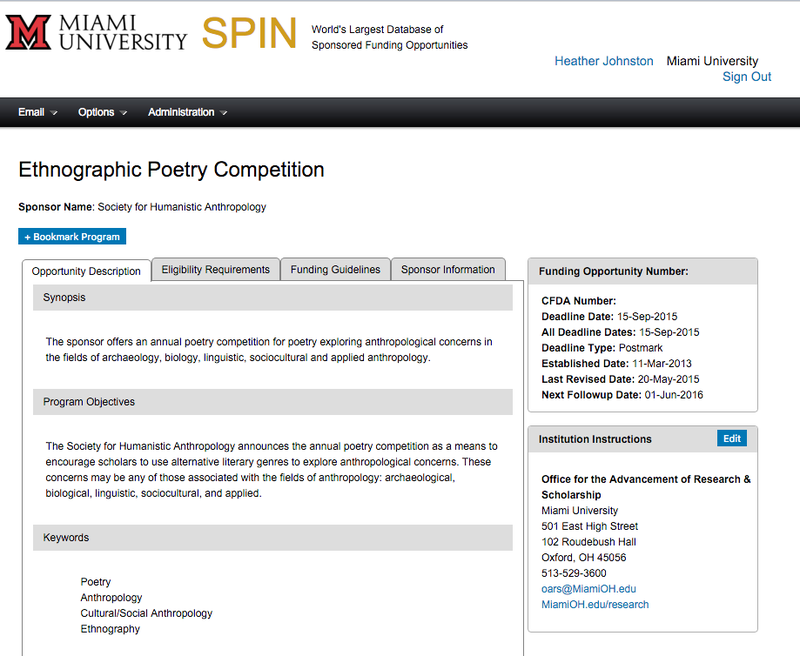 This is the third in a series of posts (the others are here and here) designed to help Miami University faculty, staff, and students learn to use SPIN to find potential sources of funding for their research, scholarly, and creative projects. You will need a profile if you want to bookmark records in SPIN. For more about accessing SPIN and creating a profile, read this post. In this post, we will be talking about what you can do in SPIN after you conduct a search. If you need to brush up on conducting searches on SPIN, read this post before continuing here. To get a preview for any opportunity in the list, click the + in the far left column, next to the “SPIN ID” for the opportunity. To view a full record, click on the link for the opportunity in the “Opportunity Title” column. A pop-up window will display the full record. 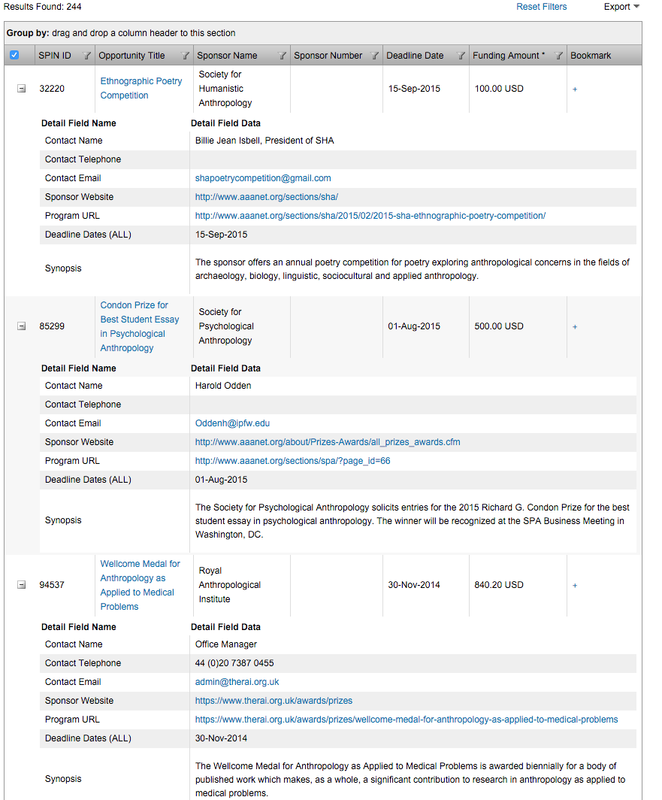 Note that to see all of the available information for the record, you will need to click through the tabs — “Opportunity Description,” “Eligibility Requirements,” “Funding Guidelines,” and “Sponsor Information” — that appear at the top of the record. To sort the list of return results by a particular column, click in the column header. To sort by multiple columns, drag the column headers and drop them into the “Group by” table header in the order you want to sort. Once you find an opportunity that looks like it might be a good fit for your project, you can bookmark it to make it easier to find later. 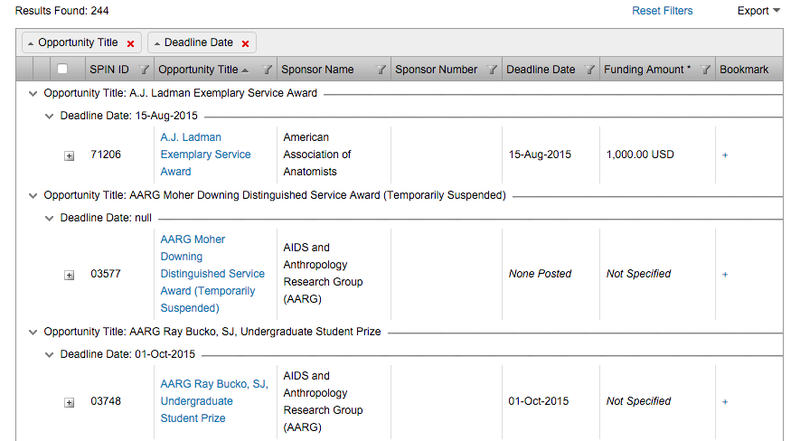 To bookmark an opportunity, click on the + in the far right “Bookmark” column for that row. In the bookmark pop-up window, click the Create new group radio button and enter a name for what the record relates to (e.g., your project name). Hover over Bookmarks in the black menu ribbon. Hover over the name of the group you added the bookmark to. Click on the name of the opportunity. The record will open in a new window. To remove a bookmark group, hover over Bookmarks in the menu ribbon and then click on Manage Bookmarks. On the next screen, click the X in the far right “Delete” column for the row of the group you want to remove from your bookmarks. To remove a bookmark, begin by clicking the + in the far left column for the row of the group that contains the bookmark. Once the group is expanded to display the bookmarks it includes, click the X in the far right “Delete” column for the row of the opportunity you want to remove from your bookmarks. Finish by clicking the blue Save Changes button to the upper right of the bookmark table. For Bookmarks only: Click the + in the far left column for the row of the group you want to create the report on. 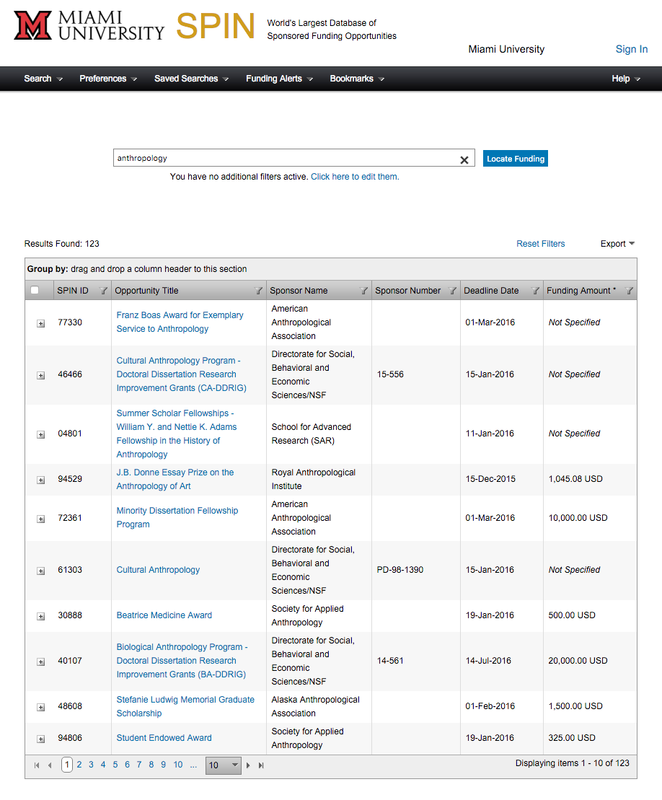 Hover over Export to the upper right of the search results or bookmarks table. Select To MS Word or To MS Excel, depending on your preference. Follow the prompts to download your report. In the next SPIN post, we’ll show you how to set preferences and filters. Bookmark image by sirooziya via Wikimedia Commons, used under Creative Commons license. 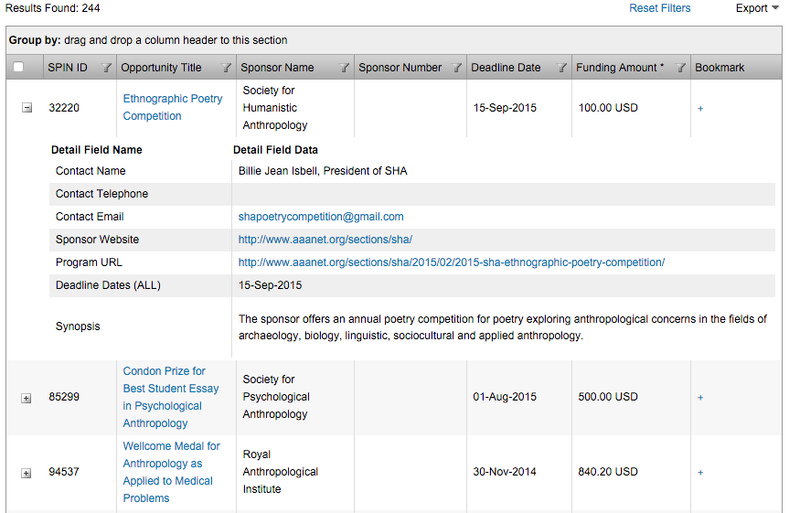 This entry was posted in Finding funding, Funding opportunity notices and tagged funding opportunities, SPIN. Bookmark the permalink.